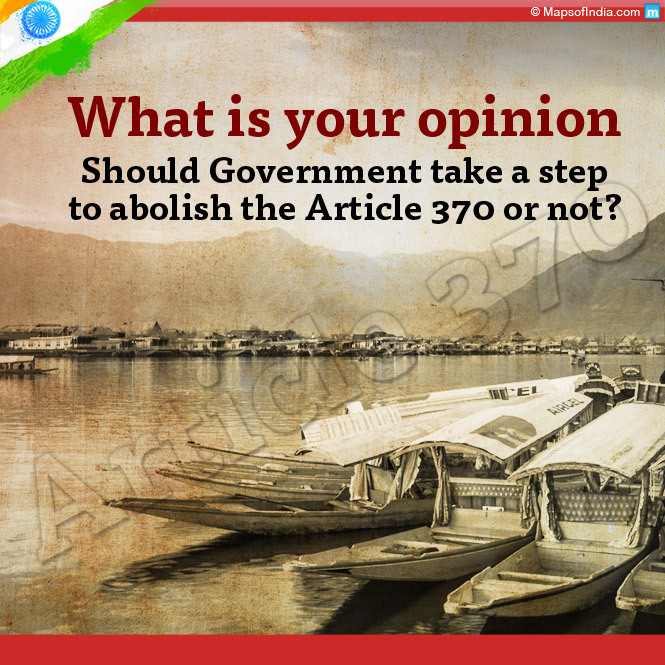 You are at:Home»Lex Pedia»Lex Articles»ARTICLE 370 IS NOT A BRIDGE BUT AN ABRIDGE! Article 370 does not display any special and unique status for Jammu Kashmir within the framework of the Constitution of India. It only displays temporary and interim measure for Jammu Kashmir within the ambit of the Constitution of India. To say that Article 370 is a bridge between India and Jammu Kashmir State is a wrong notion as it manifests that the State and India were separate entities. One may recall Vishnupuran that states that the country which is spread from Utter Himalaya to Dakshin Sumdra is the complete geographical and territorial boundaries of Bharat and the people who live in this boundary are Bhartiyya. Jammu Kashmir State thus befalls within this framework as an integral part of Indian State from time immemorial. Those who venture to say that if Article 370 is deleted or abrogated from the textual Constitution of India there will be no State of Jammu Kashmir in the geographical map of India may have to take coaching or tutoring in the history of India. Those who claim that there can’t be any discussions within the frame work of the Constitution of India reveal their mindset against India and Indian Constitution. I address an open-ended question to such elements to come out openly to clear their status: Are they Indians or not while living in the Indian State? As Indians what treatment they deserve to have under the laws for making such offensive statements? As non-Indians, do such persons have a place to stay in India? It is a known factual position that Article 370 was neither conceived within the Instrument of Accession nor a part of the draft Constitution; it was presented before the Constituent Assembly of India on 17th day of October 1947 and deliberated as well as passed as a temporary and interim measure on the same day. It is a matter of historical truth, and there is nothing pretentious about it, that it was introduced in the Constituent Assembly of India by Shri Gopalaswamy Ayyengar after persistent persuasion by the representatives from the State of Jammu Kashmir, viz., National Conference headed by late Shri Sheikh Mohammad Abdullah, the sole political party at that time, on 17 October 1949 in the form of Article 306A followed by a limited discussion and adopted for inclusion in the text of the Constitution of India the same day. It is clear that the Instrument of Accession was unconditional. The acceding Monarch Maharaja Shri Hari Singh had never used the terms “will of the people’ or “wish of the people” or “plebiscite” or any other condition in the instrument of accession. It was in line with the Government of India Act, 1935 and the Indian Independence Act, 1947. It was compatible with all norms of international law. It was legally and constitutionally beyond any shadow of dispute. It was socially, morally and politically unquestionable. It justified the reasons for belated decision to accede to India. The accession was accepted by the Government of India on 27 October 1947. The accession was with regard to the undisputed geographical and territorial boundaries of the State as they stood in the political and geographical map of the State including POJK and COJK as on 15 August 1947 and 26/27 October 1947. The accession of Jammu Kashmir State to the Indian Union in terms of Instrument ofAccession was an act of legal plenitude. Both the Acts of 1935 and 1947 stand repealed from the statutory books of India (Article 395), and, hence, instruments of accession also stand outside the realm of statutes, and as such a matter of past history, which is a dead history.The act of accession cannot be questioned. If this is questioned on the grounds of its possible illegality, unconstitutionality, then all accessions whether to India or Pakistan would be open to similar objections that may consequentially lead to disintegration inviting a Pandora box of intrigues as well as incongruities of stirring situations. WHAT DOES ARTICLE 370 ENJOIN? It is pertinent to mention three important components of Article 370, viz., “in consultation with the Government of the State”, “with the concurrence of the Government of the State”, and “the recommendation of the Constituent Assembly of the State shall be necessary”. 1. Clause 1 provides that provisions of Article 238 of the Constitution of India shall not apply in relation to the State of JK. Article 238 originally related to Part B States in the original constitutional language, which was repealed from the Constitution of India by seventh Amendment Act, 1956 as a consequence of States Reorganisation Act, 1956 doing away with Part A, B, C States. Unfortunately, it is a paradox that this Article continues to occupy a place in the language of Article 370. Clause 1 also stipulates that the power of Parliament of India to make laws for the State of JK shall be limited to (i) those matters in the Union List and concurrent List which, in consultation with the Government of the State, are declared by the President to correspond to matters specified in the Instrument of Accession governing the accession of the State to the Indian Union, viz., Defence, External Affairs, Communication, and Ancillary. (ii) such other matters in the said Lists as, with the concurrence of the Government of the state, the President may by order specify, i.e., Central laws in terms of matters enumerated in the Union List and Concurrent List shall not extend to the State of JK without the concurrence of the State Government. (iii) The provisions of Article 1 (and article 370) of the Constitution of India shall apply in relation to the State of JK. Article 1 became operative on the date of the adoption and enactment of the Constitution of India, 26 November 1949. Accession of the State of JK took place on 26-27 October 1947; JK like other Native/Princely States became an integral part of Indian Federal Democratic Republic on the date of adoption and enactment of the Constitution of India, i.e., 26 November 1949. (iv) such of the other provisions of the Indian Constitution and subject to such exceptions and modifications shall apply in relation to the State of JK as the President may by order specify : Provided that no such order which relates to the matters specified in the Instrument of Accession shall be issued except in consultation with the Government of the State, and provided further that no such order which relates to matters other than those referred to in the Instrument of Accession except with the concurrence of the Government of the State. 1. Does the President of India enjoy power under Article 370 to add a provision in the Fundamental Rights Part of the Constitution of India? 2. Can the President by Presidential Order create a classification between the citizens of India, i.e., citizens of India on the whole on the one side not to enjoy special privileges and the permanent residents of JK as citizens of India on the other side enjoy special privileges which are otherwise denied to the citizens? 3. Can the President of India exercise constituent making powers under Article 368 by adding Article 35A? 4. Is this power compatible with the constitution spirit, constitution culture and constitution practice? 2. Clause 2 encapsulates that if the concurrence of the Government of the State referred to the matters in the Union List and the concurrent List was given before the Constituent Assembly for the purpose of framing the Constitution of the State is convened, it shall be placed before such Assembly for such decision as it may take thereon. 3. Clause 3 empowers the President to declare, by public notification, that Article 370 shall cease to be operative or shall be operative only with such exceptions and from such date as he may specify: Provided that the recommendations of the Constituent Assembly of the State shall be necessary before the President issues such notification. The Constituent Assembly of the State finally adopted and enacted the Constitution of JK on seventeenth day of November, 1956 that was inaugurated on 26 January 1957 duly approved the accession in terms of Instrument of Accession in unequivocal Preamble constitutional language the integration of the State of JK to the Indian Union, viz., “in pursuance of the accession of this State to India which took place on the twenty-sixth day of October, 1947, to further define the existing relationship of the State with the Union of India as an integral part thereof”. Section 3 of the Constitution of Jammu and Kashmir states: “The State of Jammu and Kashmir is and shall be an integral part of the Union of India”. Section 4 of the Constitution of Jammu and Kashmir further states: “The territory of the State shall comprise all the territories which on the fifteenth day of August, 1947, were under the sovereignty or suzeranity of the Ruler of the State”. Section 147 of the State Constitution empowers the State Legislature to amend the Constitution of the State except the amendment of Sections 3, or 4, or 5, or 147 or the provisions of the Constitution of India as applicable in relation to the State. The Constitution of Jammu Kashmir does not make any reference to Article 370 in its relation to India. So, where is the question that it is a bridge between the State and the Indian State! In the backdrop of the above, the State Legislature enjoying constituent making power under Section 147 of the State Constitution can recommend to the President of India to abrogate, by public notification, Article 370. Article 368 does not curtail the power of the President under Article 370. Or, the Parliament of India enjoying constituent power under Article 368 on her own can delete or erase the proviso and thereafter delete or abrogate Article 370 from the textual Constitution of India. Article 368 does not curtail the power of the Parliament under Article 370. It is co-extensive with the power to amend. Parliament had done so by adding explanation in the language of Article 370 in 1965 by substituting the words Governor in place of Sadar-i-Riyasat and the Constitution of Jammu Kashmir was accordingly amended by replacing Sadar-i-Riyasat and Prime Minister by Governor and Chief Minister vide sixth amendment Act 1965.